Last month, STARBREAKER — the group featuring vocalist Tony Harnell (TNT, SKID ROW) and guitarist Magnus Karlsson (PRIMAL FEAR) — released "Pure Evil", its first new song in more than a decade and the first taste of the group's forthcoming third album, "Dysphoria". Featuring an aggressive, JUDAS PRIEST-like vibe, the track was described by Harnell in a press release as "the heaviest ['Dysphoria'] gets and not indicative of the album as a whole," comments he echoed during a recent interview with Totally Driven Radio. "The rest of the album is not like that," Harnell explained (hear audio below), "but the label thought it would be a great first single, and I think it's perfect, because it's really getting people's attention. It's just a very simple, pedal-to-the-medal, short and sweet, fast, heavy song, and I don't think people have heard me do this kind of thing for a long time, so it's kind of cool... A lot of the other songs are just really well-written, melodic hard rock/metal, a little bit proggy, even a little goth-y at times, with some of the moody kind of stuff. I think for a first song, and it's been a really long time, I think this was an effective thing. It's a simple, pure, honest metal song, and I think putting out a song that would be more thoughtful is a good idea for the second single, because now people are like, 'Okay, you have our attention,' and now they'll maybe sit back and listen to something. I think putting out something first that required more time to listen and absorb is maybe a little difficult after being away for so long, so it's nice to kind of slam people over the head and then say, 'Okay, now here's the nice song for you to maybe fall in love with and absorb, and has a little more color and texture and meaning and so forth.' Not that this one doesn't have a lot of meaning, because certainly the lyrics have quite a lot of meaning." "Dysphoria" marks Harnell's first full-length studio release since his 2013 folk-rock effort "Tony Harnell & The Wildflowers Featuring Bumblefoot", a collaboration with former GUNS N' ROSES and current SONS OF APOLLO guitarist Ron "Bumblefoot" Thal. 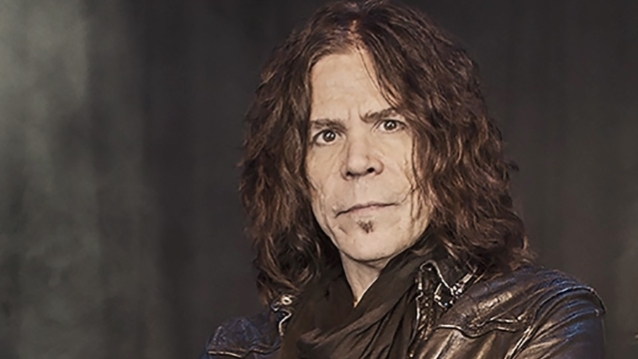 "It's exciting for me," Harnell said of "Dysphoria". "I'm excited because it was an interesting record to do and it reflects a lot of things and a lot of experiences that I was experiencing at the time I was writing the songs. I'm just excited I have new music out, because I've been mostly touring the last five, six years, so it's nice to get some original music out there. I hope not to have such a big gap between records [in the future], and I won't for a while, because I actually just finished another one — but we won't talk about that yet. We'll talk about that when the time comes." Although STARBREAKER has yet to perform live, Harnell hopes that will change soon after the release of "Dysphoria". "We do hope to eventually get some live shows going with this band," he said. "We haven't played live yet, but I hope we will." STARBREAKER started as Harnell's side project while he was still fronting TNT. He was initially working on a solo record with Karlsson, former TNT drummer John Macaluso, and bassist Fabrizio Grossi, but they morphed into STARBREAKER, releasing their first self-titled studio album in 2005. In 2007, Harnell flew to Sweden to write the bulk of the songs for the new album with Karlsson, and started recording the new songs at the end of that year. The group's second album, "Love's Dying Wish", was released in 2008. It featured new bassist Jonni Lightfoot, who replaced Grossi, and was produced by Harnell and Karlsson, with Tommy Hansen (TNT, PRETTY MAIDS, HELLOWEEN) serving as the mixer. The songwriting process for "Dysphoria" started before Harnell rejoined TNT in 2016, but it was after his ultimate split from that band in October 2017 that he and Karlsson put the pedal to the metal and quickly completed the album. It showcases everything the project has become known for: metal sensibilities; melodic songs with killer hooks; thought-provoking lyrics; inventive, intricate guitar playing; occasional prog twists; a crisp production; and explosive performances from Harnell and Karlsson.